AIS premium, standard, and compact industrial AI-enabled and GPU-powered embedded computers integrate high-performance discrete NVIDIA® GPUs and Intel® workstation-class CPUs into a compact and rugged package for exceptional performance in machine learning, computer vision, image recognition, data mining, and robotics control applications. AIS’s industrial AI-enabled and GPU-powered embedded computers also bring a new level of flexibility with standard connections and interfaces with the ability to communicate directly with a wide variety of discrete sensors and edge computing devices directly and offer extensive support for a variety of high-fidelity software APIs such as and NVIDIA® CUDA®. AIS premium series industrial AI and GPU-powered embedded computers are designed to handle the most demanding deep learning, computer vision, image recognition, data mining, and robotics control tasks, integrating workstation-class Intel® Xeon® E3 processors, superior performance NVIDIA® GeForce® GTX 1080 GPUs, and additional PCIe expansion for additional high-performance peripherals. The AIS premium AI computer also offers superior uptime with ECC memory support on Intel® Xeon® models, support for RAID on up to 4 drives, and dual Ethernet connections. AIS standard series industrial AI and GPU-powered embedded computers are designed to handle demanding deep learning, computer vision, image recognition, data mining, and robotics control tasks, integrating ultra-high-performance Intel® Core™ i7 processors and NVIDIA® GTX 1050 GPUs. The AIS standard AI computer also offers additional flexibility as an image recognition system with the ability to connect multiple cameras directly to the computer using the 4 802.3at PoE+ LAN ports making it a perfect fit for security purposes such as camera surveillance, traffic monitoring, number plate recognition, lane identification, and other intelligent transportation systems. AIS compact series industrial AI and GPU-powered embedded computers are designed to handle basic deep learning, computer vision, image recognition, data mining, and robotics control tasks, integrating energy-efficient and powerful Intel® Core™ i3 processors and fast, powerful NVIDIA® GeForce® GT 1030 MXM GPUs, all while operating as a completely fan-less system. The compact AI computer also offers additional flexibility with its modular GPU system, socketed CPUs, and optional PCIe expansion, and is built to withstand some of the toughest environments with its -25°C to 60°C (-13°F to 140°F) operating temperature range. AIS Premium Industrial AI Computers are powered by NVIDIA® GeForce® GTX 1080 / 1070 GPUs and 7th/8th Generation Intel® Xeon®/Core™ i7/i5/i3 processors. 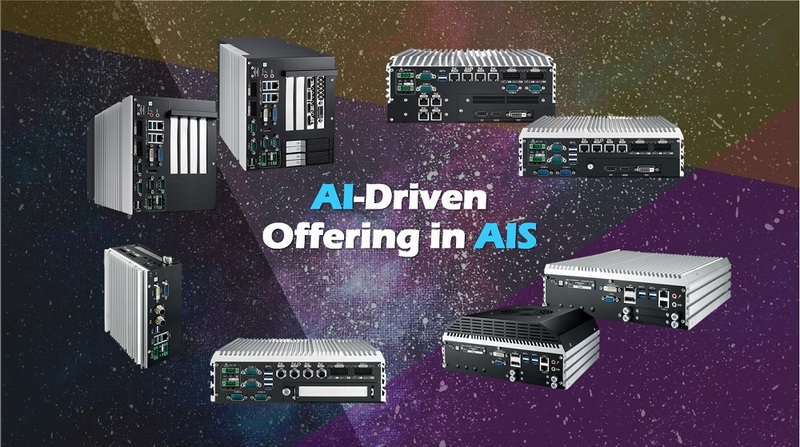 AIS Standard fanless Industrial AI Computers are powered by NVIDIA® GeForce® GTX 1050 / 1050 Ti GPUs and 7th/8th Gen Intel® Xeon®/Core™ i7/i5/i3 processors. AIS Compact fanless Industrial AI Computers are powered by NVIDIA® GeForce® GTX 1030 MXM GPUs and 7th Gen Intel® Xeon®/Core™ i7/i5/i3 processors.